The Oceanside Police Department has provided a century of service to a community that has grown from a small seaside resort—doubling as a bedroom community for the U.S. Marine Corps's nearby Camp Pendleton—into a city of more than 170,000 people. City marshals patrolled Oceanside from 1888 to 1906, and it is indicative of the city's formative years that the first lawman, former Texas Ranger Charlie Wilson, was also the first to be killed in the line of duty. The photographs in this remarkable collection inventory the department's past, covering the administrations of city marshal J. Keno Wilson (Charlie Wilson's brother), Chiefs Charles Goss, Ward Ratcliff, and others. 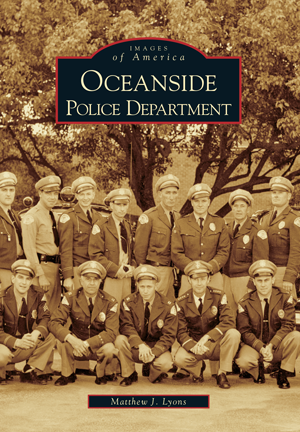 Showcased are images from the archives of the Oceanside Police Department and the collection of Delores Davis Sloan, the daughter of former captain Harold B. Davis, Oceanside's top cop of the 1930s, 1940s, and 1950s. With this book, author Matthew J. Lyons, a corporal on the Oceanside force and former Marine who was chief of criminal investigations at Camp Pendleton, furthers his avocation of preserving the memorabilia (including a restored 1968 Dodge Polara squad car) of one of Southern California's finest police forces.